As you may have heard, we&apos;ve got a thing about tea here in Boston. (If you want to learn about a vital episode in our nation&apos;s history, visit the Boston Tea Party Ships and Museum.) As much as we love tossing the stuff in the harbor, we also enjoy sharing afternoon tea. During the, um, taxing holidays, it&apos;s especially nice to take some time to relax with friends and family and warm up with a spot or two of tea. Virtually every restaurant and café throughout the city offers tea, but a few celebrate the season with special holiday teas, including the following. Be sure to make reservations at the popular events. A storyteller spins a yarn to start the family-oriented event. While adults enjoy a wide selection of teas and sandwiches, kids can indulge in hot chocolate, gingerbread men, candy canes, and other treats. 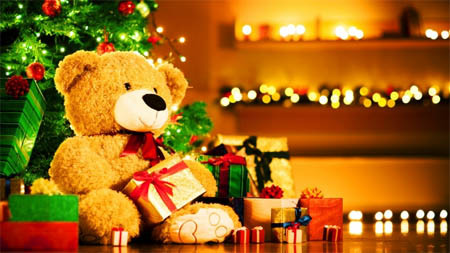 Families are encouraged to bring stuffed animals, which are donated as holiday presents to children at area hospitals. December 18 to 29, Wednesdays through Sundays (except Christmas day), weekdays at 1:30 p.m. and 3:30 p.m. and weekends at 11:30 a.m., 1:30 p.m., and 3:30 p.m.
One of the city&apos;s poshest places to enjoy afternoon tea serves a custom blend of loose leaf teas and herbals along with small plates, scones, and other accompanying food items. During the holidays, a violinist performs seasonal favorites. Complement signature tea blends with finger sandwiches and seasonal sweets such as gingerbread macaroons and egg nog truffles. A portion of the proceeds is donated to charity. Saturdays and Sundays throughout December, 2 p.m to 4 p.m. There will be some delicious Christmas cookies and other holiday treats offered along with tea as well as premium hot cocoa topped with homemade marshmallow (yum!). The restaurant is encouraging guests to bring new stuffed animals which will be donated to Boston Children&apos;s Hospital. Photos: Top: Langham Hotel. Bottom: Four Seasons Hotel.